The best backpacking tents should be weatherproof, lightweight enough to carry around in your backpack, and easy to set up. The materials and construction are the most important, but the price might also be relevant. We’ve done all the hard work for you and researched the best 1, 2, and 3-person backpacking tents – some are even under $100! We’ve summed up some specs of each tent we reviewed in the table below. Narrow down your options beforehand based on size, weight or capacity and go straight to the backpacking tents you’re most interested in for their in-depth presentations. Depending on what adventure you have planned, you may have to pack extremely light. For example, if trekking is on your to-do list, an ultra-light tent is a must. Out of all the best backpacking tents we reviewed, the River Country Products tent is the top choice for trekking backpackers. Not only is it lightweight at only 3.12 pounds, but it also packs down to water bottle size dimensions. You can buy it brand new for around $50 on Amazon. 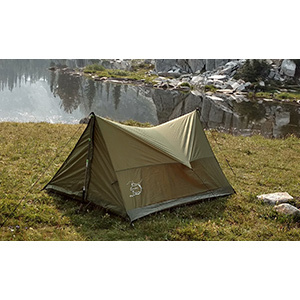 The size specs of the River Country Products backpacking tent are a dream come true for avid backpackers. When folded down and packed, the tent is merely 8” x 5” x 5”. The tent alone weighs only 2.12 pounds, while the full bundle with the stakes and carry bag weighs 3.12 pounds. You can pop up this backpacking tent in no time with the 8 metal stakes provided and your own trekking poles. Do note that you need to purchase poles separately if you don’t already have some. Backpackers have spoken highly of the River Country Products tent in terms of build quality. It features durable materials that are bound to last in time and bad weather. Even though the tent feels fairly sturdy, it appears to dip in the middle no matter how you set it up. Another small inconvenience is that you don’t get that much ventilation, due to the lack of extra doors or windows. You might need to keep it unzipped in the front when camping in warm weather. If you have a trekking trip ahead, the River Country Products backpacking tent is definitely for you. It’s incredibly lightweight and compact, allowing you to save space for extra gear if using it by yourself. It’s definitely one of the best budget backpacking tents for 1 or 2 people. Never underestimate the destructive potential of the great outdoors; you can come across life-threatening situations in nature, so you always have to be prepared. Even if you don’t plan on camping when backpacking, an emergency tent shouldn’t be missing from your gear. If you want the cheapest backpacking tent you could find, choose the SE ET3683. Its list price is around $30, but you can often get considerable discounts that bring the price of this emergency tent below $20. The SE ET3683 was specifically designed to use in emergency situations. The interior features full aluminum coating meant to preserve heat in harsh conditions. On the other hand, the fabric used for the exterior is striking red orange for extensive visibility. The package you receive also comes with 4 steel pegs and a 23-foot rope for setting the tent up in between trees. As we mentioned, the SE ET3683 is for emergencies, which means that it’s not recommended for regular, long-term camping. Consequently, it’s not a high-quality tent. Although the model is indeed reusable, you should use it only in the urgent situations mentioned. Be careful when staking the tent down, as the anchoring loops are reported to break easily. We encourage any backpackers to have an emergency tent like the SE ET3683 handy when hiking. It’s particularly recommended for users that don’t have standard camping planned as part of their trip. Devoted explorers know that it’s essential to invest in the best backpacking tents with optimum quality. Even if this often means paying a little more than the average market price, it will be worthwhile for frequent travelers. A fantastic example of a high-quality tent is the Kelty Salida 1, one of the top 10 Backpacking Tents on Amazon based on sales. If you order it online, you’ll pay somewhere between $104 and $145, depending on promos, making this one of the best backpacking tents under $200. 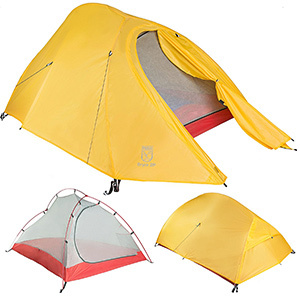 Kelty offers three sizes for their Salida model, to accommodate one, two, or four people. The Salida 1, as you can guess, is the best one man tent for backpacking on our list so far. When packed, the model will fold down to 11 x 14 inches. The floor area measures 20 square feet, while the vestibule of this one-man tent offers 6 ½ square feet of space. It does comes with a sturdy rainfly, but you should consider purchasing a footprint, as the Kelty Salida does not come with one. The Kelty Salida 1 uses premium quality fabrics to ensure durability. Materials range from 68D nylon and polyester for the floor and walls to 40D mesh for the screen. In fact, for its price range, the Kelty Salida 1 is actually a notably affordable backpacking tent. As for the downsides, stuffiness and condensation may become problems during certain camping conditions. All the same, you can partly unzip the rainfly to get some fresh air in, if it’s the case. 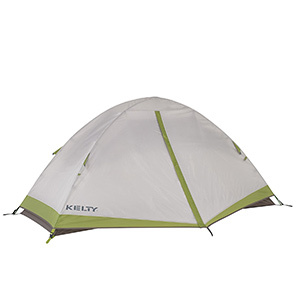 Pick the Kelty Salida 1 if quality is your #1 priority when browsing the best backpacking tents. Kelty has used sturdy materials for the model that work well for all three seasons advertised. Solo backpacking is a life-enrichening experience. However, some prefer to backpack in pairs, whether as a couple or with a close friend or family member. If you fall under the latter category, you have to look for the best backpacking tents that are a bit larger. 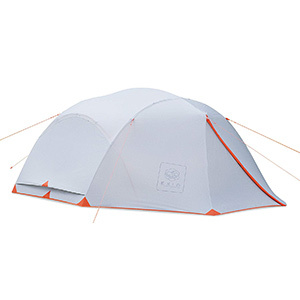 One of our favorites is the ALPS Mountaineering Lynx 2 tent. Currently available for approximately $100 on Amazon, the Lynx 2 is one of the best 2-person backpacking tent that provides plenty of space for storage. ALPS Mountaineering’s Lynx 2 has a number of design benefits for passionate backpackers. Firstly, you benefit from tons of space for storing your camping gear. Not only does the model feature two roomy vestibules, but it also has a mesh loft at the top for small essentials. 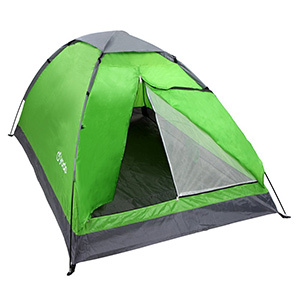 In addition to that, the Lynx 2 comes complete with a rainfly that covers the tent entirely. You will have the tent all set up in just about 5 minutes, with an extra 2 minutes for installing the rainfly. A respected company, ALPS Mountaineering is often praised for the quality of their camping products. Unfortunately, though, the zippers on the Lynx 2 have proven to be troublesome for a few users. Also, you’ll need to buy a separate floor to put under the tent, as the current one is rather thin. A major perk is the poles that come with the Lynx 2 backpacking tent – they’re made from aluminum, as opposed to most competing tent with flimsy fiberglass poles. If you’re camping with another person or you just want more space, you can count on the ALPS Mountaineering Lynx 2 tent. 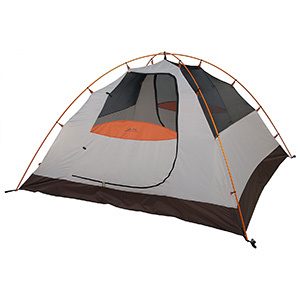 This backpacking tent under $100 is well-designed and has a great number of storage options. Why not make backpacking an experience the whole family can enjoy? Camping with your children is a great opportunity to introduce them to nature while spending time together. To start preparing, you’ll need one of the best backpacking tents under $200 that’s large enough for your family. Still, it should be light enough to carry on your back. We support the EXIO ResiTent as a fine option for multi-person backpacking. The ResiTent measures 93” x 86” x 44.75” and should be able to comfortably fit a family of four. In other words, if you’re backpacking with your spouse and two small children, you shouldn’t have any issues. While this tent is indeed heavier than any other of the best backpacking tents on our list, it’s actually surprisingly lightweight for one of its size. In addition, it will pack down to 21” x 7”. Its multiple mesh pockets are also a nice design touch. If you’re backpacking during windy season, you will be blown away (metaphorically!) by how sturdy the ResiTent is. Not only can it withstand winds over 40 mph, but it’s also amazing at blocking rainfall and even severe downpour. Although one or two users mentioned that the fabrics “feel cheap”, they certainly passed the durability test in our book. Just make sure that you get extra-warm sleeping bags, as it tends to get cold inside in this backpacking tent in unfavorable conditions. Go for the EXIO ResiTent if you want one of the best backpacking tents for camping with your kids. If you want more family-friendly options to choose from, read our guides for the best tent for family of 4 and the best 6 person tent of the year. Are you just starting out with backpacking? Semi-terrified of setting up a tent with tons of poles and stakes? There’s no better way to begin than with a pop-up tent. Also known as an instant tent, a pop-up tent does exactly what it says – immediately installs by popping up. There are quite a few pop-up backpacking tent you can find online, but we want to focus on the affordable yet effective Abco Tech Pop Up, a best-selling backpacking tent under $50. You don’t have to worry about wasting time and energy on setting up your very first backpacking tent. The Abco Tech model is ready to be pegged down in an instant, simply by taking it out of the bag. If the included diagram doesn’t provide clear enough instructions for folding it back down, you can master the process in no time with a tutorial (see below). When installed, the tent measures 71 x 95 x 39 inches, while its folded diameter is 27 inches. Sadly, quality isn’t among the Abco tent’s advantages. The materials feel cheap and will tear with ease if you’re not careful. Another major con is that the tent does not do well in heavy wind or rain, so make sure you take it only when backpacking during the summer. However, the tent’s advantages include amazing ventilation through large mesh windows and protection from heat. For a beginner backpacking tent, though, it’s just what you need. 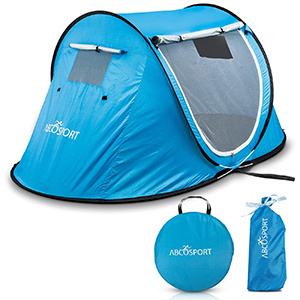 Abco Tech’s model is one of the best backpacking tents for beginners that want a stress-free experience. Setup is literally effortless, while the tent is terrific for warm-weather camping. You can also look into our best instant tents guide to explore other options. We’ve covered pretty spacious tents until now, but what if you are looking for the best one-man tent for backpacking? You should search for tents that are small, compact, and lightweight so you won’t be burdened throughout your travels. One of the best backpacking tents for campers exploring or sleeping on their own is the Winterial tent. It currently has a price of around $75, also making it one of the best backpacking tents under $100. Based on consumer reports, the Winterial tent is a best buy for solo backpackers. It only weighs 3.8 pounds and measures just 22 x 7 x 6 inches when packed. When ordering it online, you also get 3 bundles of rope and 14 durable tent stakes. Despite its large number of stakes, it’s actually one of the easiest backpacking tents to set up. Even though it’s fairly wide and provides more than enough space for one backpacker, it’s not the best option for tall users (over 5’11”). As far as sturdiness is concerned, the Winterial tent is a true gem. Campers confirm that it keeps you warm and dry in rainy weather, but also that it performs well in windy conditions. In all honesty, it won’t be the most comfortable backpacking tent you have. It will, however, serve its purpose as effective shelter when hiking or backpacking. An added bonus is the outstanding customer service Winterial provides, checking up on customers to ensure their satisfaction. Don’t hesitate to try the Winterial tent if you’re backpacking or resting alone. It has ideal size specs and will not disappoint in harsher camping conditions. If versatility makes or breaks a deal for you, we’ve found a tent that will undeniably win your heart over. The Paria Outdoor Products Bryce is one of the best backpacking tents in terms of adaptability. You can use it as a full mesh screen room, a completely enclosed tent with the rainfly, or in a variety of combined open ways. The Bryce tent is perfect for backpackers, bike-packers, and hikers alike, and is one of the best backpacking tents under $200. In addition to the size-related benefits we mentioned earlier, the Paria’s Bryce backpacking tent also has some significant design perks. 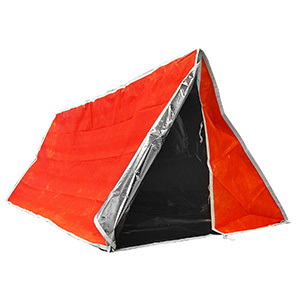 The model contains zippers both on the inside and outside of the tent, as well as factory-taped seams. Additionally, it’s one of the few backpacking tents that comes complete with the footprint you need. Even though the setup of this backpacking tent is rather simple, the lack of detailed instructions could cause minor problems when installing the rainfly. 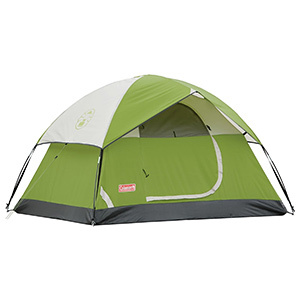 Aside from a few wear-and-tear complaints, there aren’t that many negative reviews regarding this tent’s quality. Thanks to the 40D PU floor and 20D PU rainfly and mesh, your tent should be able to hold up in time. You should note that 3.7 pounds represent the model’s trail weight, which doesn’t include the rainfly, stakes or footprint. Other than that, the Bryce tent is considerably spacious for a 2-person tent, with more than enough gear and leg room. Go for the Paria Outdoor Products Bryce tent if you want one of the most versatile models currently available online. You can use it with ease regardless if you’re a backpacker or bike-packer, and in a surprising amount of ways. We know how expensive the best backpacking tents can be. Most of the time, a standard model will be well over $50, often surpassing $100 for high-end brands. Nonetheless, backpacking on a budget is far from impossible. If you have summer adventures in store for you, try the yodo KA78000235-RV tent out. When we were preparing our review, the yodo tent is one of the best backpacking tents under $30 and the second best on our list! At this price point, you can expect the yodo backpacking tent to have only basic features. It comfortably suits two campers, with 83 x 55 x 43-inch dimensions and a weight of just 3.3 pounds. When packed, the tent will be just about 17 inches long and 4.5 inches wide. It’s cool that you can choose from three colors when ordering your tent (green, blue or orange), all for the same price. Setting it up this backpacking tent won’t be an issue, even if you don’t have experience assembling tents. There’s not that much use debating the quality of the yodo backpacking tent. It most likely won’t be a model that will last for years, especially if you backpack often. However, for any quality control issues or short-term product fails, the manufacturing company is more than happy to provide quick replacements. One major drawback is its complete lack of waterproofing, so count on it only if you’re backpacking during the summer or when the weather is fine. Get the yodo KA78000235-RV backpacking tent if your budget currently doesn’t allow you to spend more than $30 or so on a tent. It’s an outstanding value for the price and should provide a memorable warm-weather backpacking experience. There truly isn’t a camping company out there that outperforms Coleman. They have some of the most affordable backpacking tents on the entire market that still pack in astounding quality. 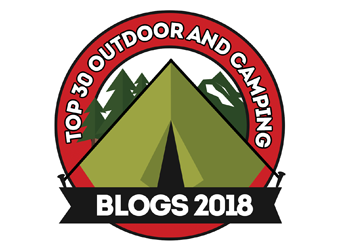 The absolute best backpacking tent in 2018 is undoubtedly the Coleman Sundome 2. The top-rated tent costs around $33 with shipping and is a double best-seller on Amazon, securing a #1 spot in Backpacking Tents and #2 place in Family Camping Tents at the moment of writing. What’s not to like about the Sundome 2backpacking tent? It’s super spacious, has a generous center height, good zippers, and an easy-to-setup design. As opposed to numerous tents from competitors, the instructions you receive are clear, allowing you to assemble the tent in minutes. Thanks to the mesh roof, you can even fall asleep stargazing during the summer. When ordering the Sundome 2 online, you can choose a green or navy colorway, according to your preferences. Coleman tents are all about blending high quality with accessibility. The Sundome 2 may not be the most lightweight backpacking tent on our list, but it will provide the sturdiness required for any potential weather disappointments. Coleman’s WeatherTec technology ensures that it stands strong in heavy rain or even winds over 50 mph. While the tent truly is waterproof, you can further prevent any small leaks by spending a few more bucks on a seam sealer when placing your order. Without hesitation, the Coleman Sundome 2 outshines any other of the best backpacking tents we have reviewed. The spacious but compact tent supplies massive quality for an unbeatable price during any of the three main camping seasons. In closing, the best backpacking tents should be fairly-priced, high-quality, sturdy, and reliable. Now that you have a selection made for you, all you have to do is choose your ideal model based on details like capacity, packed measurements, waterproofing or accessories provided. If you’re a first-timer, make sure that you read more about how to further prepare for backpacking before you leave. Get ready for the experience of a lifetime! What amazes me most is the stable back packing feature of River Country Product. Coincidentally, i don’t sit well with much air. Hence it’s sturdiness and less ventilation is quite favourable on my side. Thanks for the feedback, we’re glad you had a pleasant experience. I had a worthwhile experience in the past summer holidays, a sudden whirlwind nearly took me off balance. It was cool I had SE ET 3683, i took an apparent refuge in it. Again the price enticed me to make a purchase. Camping never interested me until my boyfriend insisted that we tried it this summer. I have to say I enjoyed it. We are looking around for a better tent than the one we have, and we are in the brainstorming phase. Proper ventilation is important, and we want to go several times again this summer. 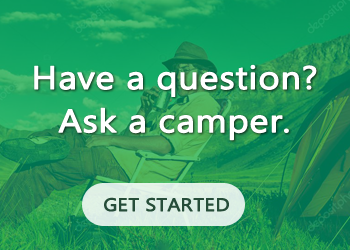 What do you recommend for a newbie camper? Welcome to the camping family. If it will be only you and your boyfriend camping, we recommend the yodo tent, perfect for a couple just beginning their outdoors adventure. 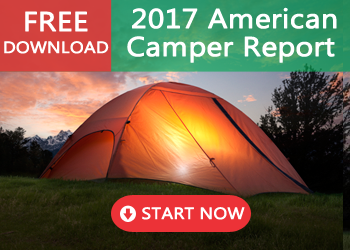 My cousin is an avid camper and I am here looking to find the best kind of tent for his needs. I like how the Kelty Salida 1 sounds, and I am thinking about surprising him by buying that one. We are very close so I am sure he would be more than surprised and appreciative. That sounds amazing, good choice. Thanks for the feedback! THe Paria Outdoor Products Bryce tent sounds like it is ideal for us. But what concerns me is that the instructions you say are poor with this tent. Is it possible that I can find some good instructions for setting it up from an online source? Luckily the company has shared an official video with instructions on how to set up this great tent. Check it out below here. Happy camping, thanks for the feedback! I’m looking for tents and it seems to me like more often than not, most of them are not waterproof and are made out of lousy fabrics. I will have to read recommendations from other sources because I have no idea what to even consider! I don’t want the tent to fall apart within a year. Thanks for the feedback. We suggest going for Coleman, it is a reputed brand and their Sundome 2 should meet your requirements. Let us know how your search goes. Have an awesome day! Our family likes to trek and therefore the ideal backpacking tent for us is the River Country Products tent. The only complaint we have about this product is that the ventilation is not the best. Otherwise, it’s good if you like trekking like we do. Thanks for your feedback, we’re glad you enjoy camping just as much as we do. What other product do you prefer? Summer is almost over and our family did not go camping. Even though there is still some summer left, we don’t have time to camp with the kids going back to school and all. However, I am bookmarking this page so I can decide which backpacking tent to get for next summer. Thank you so much for the feedback. Plan ahead, buy a sturdy tent and you and your family will have an amazing time. That makes sense that the SE ET3683 backpacking tent is meant for emergencies only. It would be a terrible tent if it was used for normal everyday kind of camping. It is very cheaply made and just not a high-quality tent. Thanks for sharing your opinion! Indeed, the SE ET3683 is only recommended in emergency situations, not for casual camping. Because summer is almost over, and I don’t like to camp during the cooler months, I am going to look into purchasing the right backpacking tent for our needs so we can enjoy camping next summer. This is a great list and I’ll have to weigh the pros and cons of each. We have the River Country Products tent as I feel it is satisfactory enough, and the only solution to improve the ventilation is to cut a few small holes in the tent. Just be prepared that some rain will end up trickling in though. I like the River Country Products tent quite a bit as I have used this backpacking tent for several years now. Space is great and the ventilation is not perfect. However, it is better than how it is portrayed online. Which backpacking tent would you recommend that is under $100? I mean my funds are tight right now and my gosh I want to go camping so badly. But I cannot afford to buy a regular tent. I also know I can’t be overly picky about the quality either. Because we are heading into some very cold weather soon (Toronto), what do you recommend as the best backpacking tent to us during the winter? It is nice to go camping during the summer, but I want to start taking advantage of it at all times of the year. The River Country Products backpacking tent is amazing and is really a dream that has come true for me. This tent is the best around ever, and it took me some time to find the best one for my family. I finally did. I want to purchase a backpacking tent that can be used at all times of the year, rain or shine, snow or dry, cold or warm. Is there a particular tent that is ideal for that kind of thing? Or is it only for warm and dry. Hi, Elsa! The Coleman Sundome 2 is a good option because it’s designed to serve all three main seasons, it’s waterpoof, and can stand winds over 50 mph. However, if you plan on camping in extreme cold weather with heavy snow, we suggest you purchase a tent specifically designed for such conditions. I am currently looking for a good quality backpacking tent that has good ventilation. That seems to be the biggest challenge when it comes to these tents. I really enjoy camping but the lack of ventilation is a big downer. It is extremely rare to find a good tent that has proper ventilation and a tent that is easy to set up. That is because I am not sure if it really exists. I have not come across any of them personally.